Online Reputation Management has become an integral part of any brand’s digital strategy, as the online consumer base is constantly growing. According to a recent survey, 70% of Indians online prefer or have used Social Media for customer service or purchase recommendations at least once. With more and more consumers actively sharing and looking out for information online, it becomes crucial for brands to have a successful ORM strategy in place. It is the process of managing and improving your brand's reputation through positive content promotion and prompt redressal of consumer complaints and grievances online. This customer-centric approach ensures credibility and helps monitor the brand sentiment online. In order to maintain a positive brand image, businesses need to constantly monitor conversations around their brand and the industry across social media, community forums, review sites, blogs and all over the internet. There are ORM tools available to track, analyse and manage online content, thereby making it easy for brands to streamline the process and carryout quality checks frequently. • Listen or Lose: Knowing what your customers are talking about your business online is very crucial for customer retention and acquiring new prospects. Majority of the consumers today refer to reviews and recommendations on various sites and social media platforms before making a purchase decision. Witnessing negative feedback about your service or product online can lead to distrust and drop in sales. Hence, a timely response system needs to be in place to address customer grievances not just on social media, but also on review portals and forums that can show up on the Google Search results. • Respond to Regain Trust: One of the most common mistakes that brands make when it comes to Online Reputation Management is deleting or avoiding a customer complaint. Covering up an issue is never a solution, as customer stories tend to have a greater reach and impact. Consumers appreciate public signs of transparency and honesty; hence always respond to negative comments and take the issue offline if needed. When the issue is resolved promptly, there are higher chances of this troubled customer turning into a brand evangelist and post positive feedback about the brand’s approach and customer service. To know how you can efficiently track and respond to feedback on social media, see our detailed blog. • Be Quick to Acknowledge Feedback: According to an average Internet user, a brand needs to respond to a consumer’s query or feedback online within 30 minutes or an hour. Prompt response with a relevant solution goes a long way in showing consumers that you are listening to them. It’s also one of the easiest ways to win back your customer’s trust and let them know you value them. If you are unsure about something, it is always better to inform your customers that you are looking into the issue and will get in touch shortly regarding the corrective action. Because, more the time taken to respond, severe the damage is. If you are a B2C brand where the consumer engagement rate is high, opt for ORM tools that can help you streamline this process. • Climb the Search Engine Ladder: There are close to 91 Million searches performed on Google each day. How many of those do you think could be about your brand? Big or small, leverage on SEO to make positive content dominate the Google Search results and push down the negative references about your brand. Promoting fresh, useful and positive content on various web pages about your brand can help in outranking negative comments over a period of time. Most brands also take an integrated approach to effectively use Influencer Marketing in order to create positive word-of-mouth. This includes creation of blogs or reviews across community platforms, online review portals and social media. • Customer Delight Made Easy: Being available online and making customer interactions meaningful helps in exceeding their expectations. A happy customer likes to share positive experiences and eventually becomes a brand loyalist. Businesses in the servicing industry can take the ORM route to dominate the competitive marketplace and demonstrate their trustworthiness & commitment to customers. In order to achieve this, brands need to actively track brand mentions and follow conversations online to respond and initiate conversations. Being proactive not only helps to keep negative sentiments at bay, but also helps in building a positive brand perception. JetBlue is an airline company in United States, well known for its customer service. 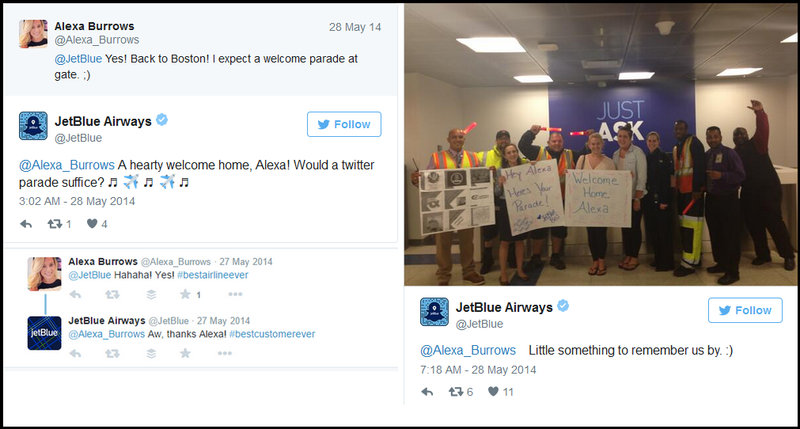 When Twitter user Alexa Burrows randomly tweeted about the end of her holiday and jokingly asked the airline company for a welcome home parade, JetBlue did go that extra mile to delight the customer and created a positive brand experience. • Establish your Brand Personality: Even though most brands are online and making efforts to improve customer experience, only few stand out. A unique approach towards addressing concerns and encouraging conversations helps in building the brand and differentiating yourself from the competitors. Online Reputation Management also serves as an opportunity to showcase your brand persona and cultivate a social media voice that will amaze your consumers. Being witty and creative is one of the easiest ways to get noticed and make an impact on digital media platforms. Below is an example of Ola’s quirky response to a customer. Online Reputation Management could be the missing piece in your digital strategy if you’re looking to create a difference and delight customers, but not there yet. Have you deployed effective ORM strategies for your brand and witnessed how it’s making or breaking your brand? Do write to us in the ‘Comments’ section.